A computed tomography (CT) scan of the abdomen with oral and intravenous contrast showed a moderately large mass lesion with thin enhancing walls in the right iliac fossa region (Figure 1). There was a presence of a rent (Figure 2) within the lateral aspect of its wall. 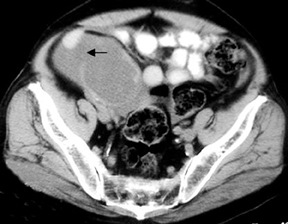 Fluid-like internal contents of the mass (17-20 HU) had spilled into the peritoneal cavity, causing moderate ascites, and had extended along the inguinal canals bilaterally adjacent to spermatic cords (Figure 3). An exploratory laparotomy was performed and the enlarged, thin-walled ruptured mucocele of the appendix was resected. A small adenomatous polyp causing obstruction was found near the mouth of the appendix and confirmed on subsequent histopathology. A mucocele of the appendix results from the abnormal accumulation of mucus within the lumen of the appendix. It is uncommon, with are ported incidence of 0.2% to 0.3% in appendectomy specimens. 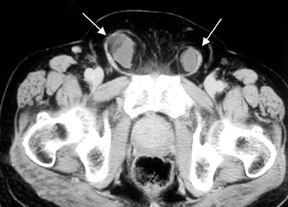 There is a female:male predominance of 4:1 and the mean age at presentation is about 55 years.1,2 Clinical features include pain in the right lower quadrant, a palpable abdominal mass, and intermittent colicky pain.Approximately 25% of mucoceles are asymptomatic and discovered incidentally on surgery. Obstruction is commonly post-inflammatory, but it can also be due to fecoliths, congenital obstruction of Gerlach’s valve, or extramural compression. 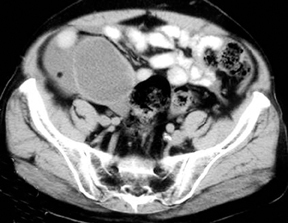 A typical imaging finding is a cystic mass in the expected region of the appendix. A curvilinear calcification may also be seen in the right lower quadrant. Barium studies may show an extrinsic impression on the cecum, terminal ileum, or sigmoid colon. Ultrasound examination usually reveals an oblong heterogeneous cystic mass with through transmission and posterior enhancement. The degree of internal echogenicity varies with mucin viscosity. Lesions are well-encapsulated unless they have ruptured. Madwed D, Mindelzun R, Jeffrey RB Jr. Mucocele of the appendix: Imaging findings. AJR Am J. Roentgenol. 1992;159: 69-72. Dachman AH, Lichtenstein JE, Friedman AC. Mucocele of the appendix and pseudomyxoma peritonei. AJR Am J. Roentgenol. 1985;144: 923-929. Skaane P, Ruud TE, Haffner J. Ultrasonographic features of mucocele of the appendix. J Clin Ultrasound. 1988;16: 584-587. Kim SH, Lim HK, Lee WJ, Lim JH, Byun JY. Mucocele of the appendix: Ultrasonographic and CT findings. Abdom Imaging. 1998;23:292-296. Higa E, Rosai J, Pizzimbono CA, Wise L Mucosal hyperplasia, mucinous cystadenoma, and mucinous cystadenocarcinoma of the appendix: A re-evaluation of appendiceal “mucocele.” Cancer. 1973;32:1525-1541. Rampone B, Roviello F, Marrelli D, Pinto E. Giant appendiceal mucocele: Report of a case and brief review. World J Gastroenterol. 2005;11:4761-4763. Ruptured giant mucocele of the appendix with pseudomyxoma peritonei. Appl Radiol.